I have an interest in German fighter pilots during World War II (yes, it's a research project joint with Philip Ager and Leo Bursztyn). 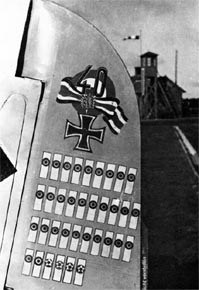 We particularly care about status competition amongst top-scoring pilots (the image on the left shows victory marking on the tailgate of a Messerschmidt). We need data on pilot training, especially a brief history of which fighter schools people passed through (Luftkampfschule and Jagdfliegerschule). Anyone who can send me a detailed list containing that information about the top 200-scoring German aces should get in touch via email -- I promise to pay $1,000 or euro equivalent (first $500 for the first 100; the next $500 for the second). We have tried our luck in the archives, to little avail; but it may just be possible that enthusiasts somewhere sit on this information, or something closely related... So let's see if "markets in everything" actually works (or prizes for the right kind of thing). *** update 30-1-2017 *** We have actually located the right source for this (and no, nobody sent in the winning suggestion - just hard work with the German federal archives allowed us to locate the right place).